Binyamin Appelbaum puts together a lot of information on the main contenders for the top job at the Fed. Never before has the “selection process” gone this public. Maybe this has to do with the fact that the Fed hasn´t been doing a stellar job? 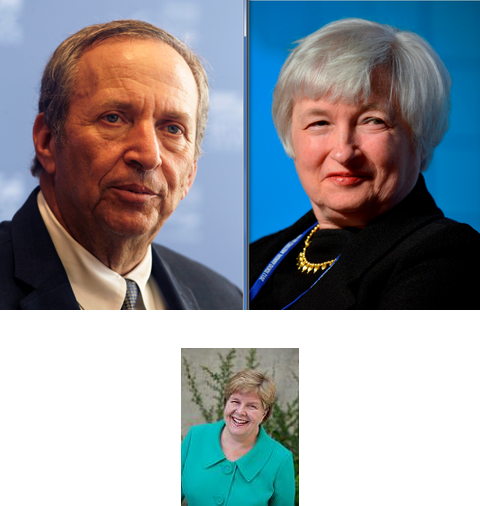 There are indications that Mr. Summers and Ms. Yellen “disagree about the central issue confronting the central bank: how much longer and how much harder to push for economic growth.” They share a conviction that the Fed can and should seek to stimulate the economy during periods of slack demand. But Mr. Summers appears to have less confidence in the tools available to the Fed at the moment, and greater concern about the potential consequences. Mr. Summers has largely avoided talking about monetary policy in recent years, at least in public settings, but there are plenty of breadcrumbs. At a private investment conference in April, he said the Fed’s bond-buying campaign probably wasn’t doing much good. He added that it also wasn’t likely to cause inflation, but in a 2012 paper he worried that the Fed’s stimulus campaign could destabilize financial markets. Ms. Yellen, by contrast, has regularly defended the Fed’s policies as both safe and effective. Both Mr. Summers (in a column for The Financial Times) and Ms. Yellen (not least by voting for it) have publicly endorsed the Fed’s other effort to suppress interest rates, by declaring its intention to hold short-term rates near zero at least as long as the unemployment rate remains above 6.5 percent. (Mr. Summers endorsed the idea but not the specific threshold.) But Mr. Summers has a history of skepticism about the Fed’s move toward predictable policy-making, beginning with his 1991 declaration that “monetary rules should be avoided.” Support for such rules has strengthened over the last two decades, but the Stanford economist John Taylor, a leading proponent, wrote last week that Mr. Summers appears to have retained his skepticism. Such a target would commit the Fed to getting us back on the trajectory for nominal GDP that we were on before the crisis—and then to keep us there.